I grew up with a stainless steel double basin sink, and after I left home and went to college and lived in dorms and college houses I suddenly realized that not everyone had a double basin sink (or garbage disposal). While I still love the convenience of double basin sinks, the trends in kitchen sinks have been dramatically changing and not as many people seem to go with that option. Here are some new styles of kitchen sinks that might entice you for your kitchen update. 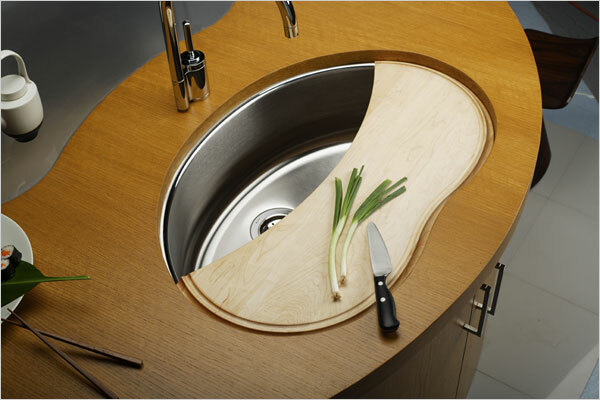 Lima Bean Sink with removal wood cutting board by Elkay. Sinks aren't just sinks anymore, they now come equipped with all kinds of accessories to make your cooking experience even more practical, easy to clean and of course, quicker. Great examples are the cutting board in the sink above, or all the accessories in this sink below. Don't like all the hassle of lots of accessories, but need some extra sink space? Maybe you need to install a small prep sink. Like this ultra modern example. I love that this has two spigots, a cool and practical new trend. But it also is a twist on the ever growing popularity of the apron front farmhouse basin. While farmhouse sinks are seen mostly in classic white, you can take an original spin on this trend by using a less traditional color like the black shown here, or maybe even blue, green or yellow. This entry was posted on Tuesday, March 24th, 2009 at 03:03 pm and is filed under Uncategorized , Kitchens . You can follow any responses to this entry through the RSS 2.0 feed.